On the first page of this collection of pages about Kamakura I described arriving there by train and where I stayed. Now let's look around a little. Too many of these pages take deep dives into Buddhist eschatology, Shintō cosmology, and history from Neolithic times through World War II. This page does not. 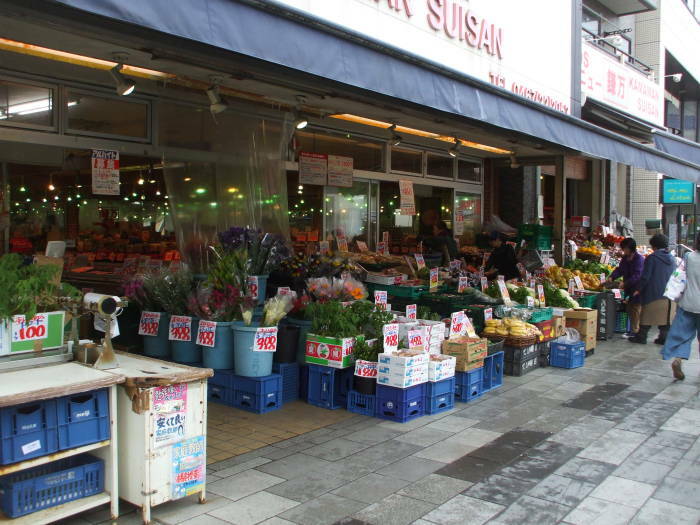 We will visit the beach, the grocery store, a couple of stand-up bars, and more. 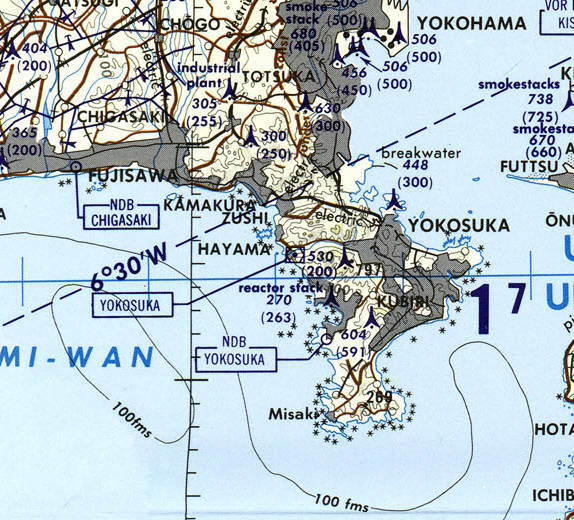 We're on the south coast, the ocean-facing coast, of a peninsula just south of Tōkyō. 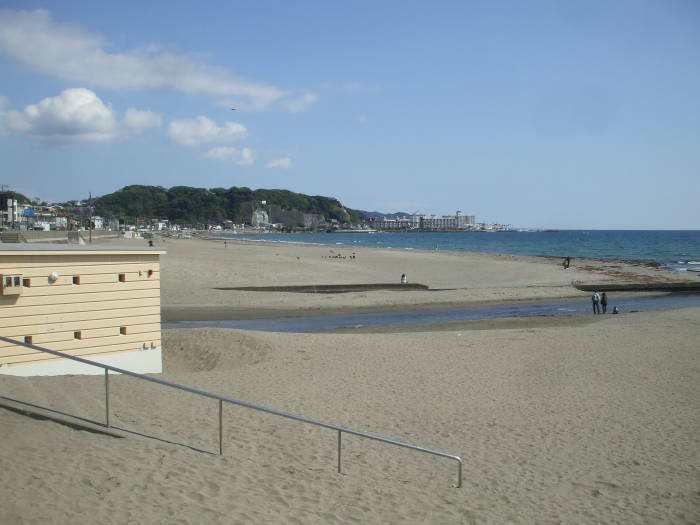 We're very close to Tōkyō but Kamakura seems like a coast town far from the big city. Kamakura faces Sagami-wan or Sagami Bay, opening into the Pacific Ocean. 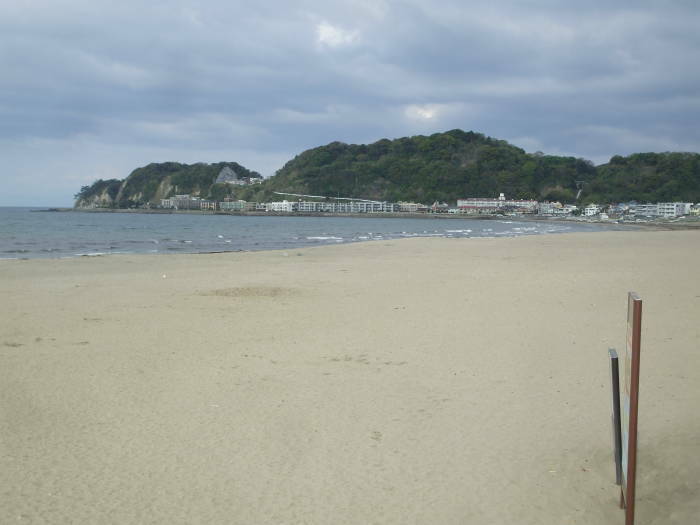 The town is surrounded by a series of hills and ridges, which served as excellent natural defenses back when the Kamakura Shōgunate ruled Japan. Now there's wind surfing, regular surfing, and sailing. It felt to me like a Japanese version of a southern Californian beach town, like El Segundo or Manhattan Beach. A sign at the beach warns "Beware of Hawks". Yes, and also the crows or ravens. I didn't notice many sea gulls at all, but there were a lot of hawks. Almost as soon as I arrived at the beach, two girls sat on the wall right next to this sign. They had ice cream. And soon, they had the unwanted attention of some aggressive hawks who wanted their ice cream and anything else they had. 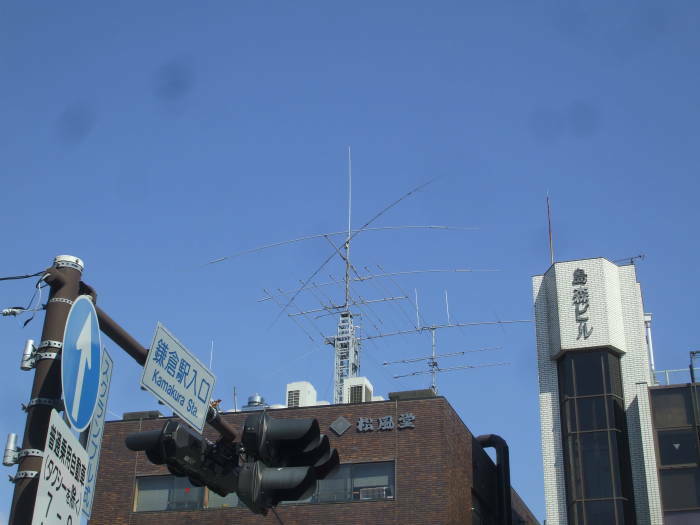 There are some impressive amateur radio antennas in Kamakura. In the foreground along the beachfront road, there's a multi-band Yagi and a 40m (7 MHz) dipole, and in the background, two single-band Yagis, I think for the 20m (14 MHz) and 15m (21 MHz) bands. The Yagi-Uda antenna is now the standard narrow-band directional antenna for HF through UHF frequencies. 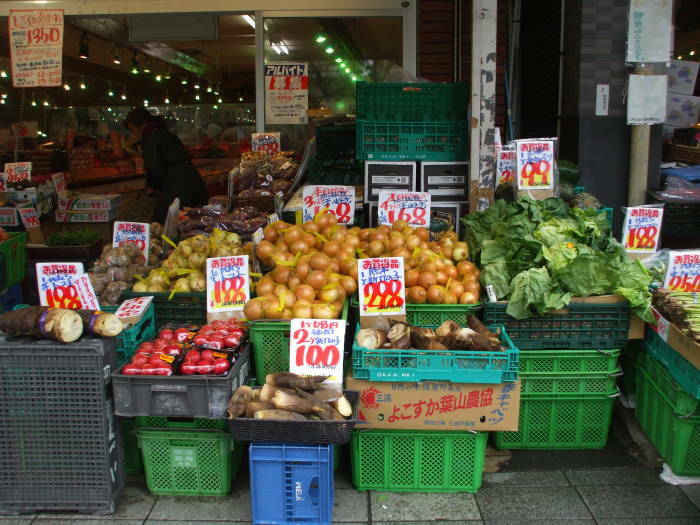 It was invented in 1926 by Shintaro Uda and Hidetsugu Yagi of Tohoku Imperial University. Uda did most of the design work, but Yagi published the first English-language reference on the design and filed the patent without Uda's name on it. So we tend to call it simply a "Yagi antenna". I said that there wouldn't be esoteric details of Buddhism and Shintō on this page. I never said that electromagnetics wouldn't come up. Let's continue up Wakamiya Ōji, the main street through Kamakura. It leads from the beach through a series of torii or gates to Tsurugaoka Hachiman-gū, a Shintō shrine central to the town's history. 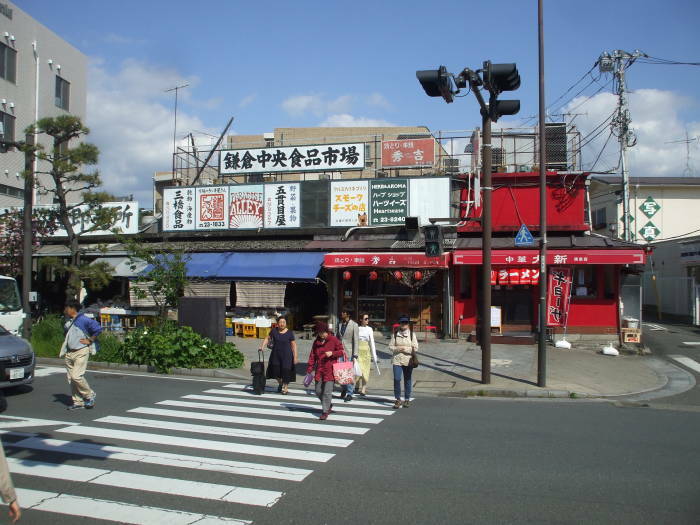 Back in the old days, this road was the ritual axis of Kamakura. But we're looking at mundane everyday things, not the history. 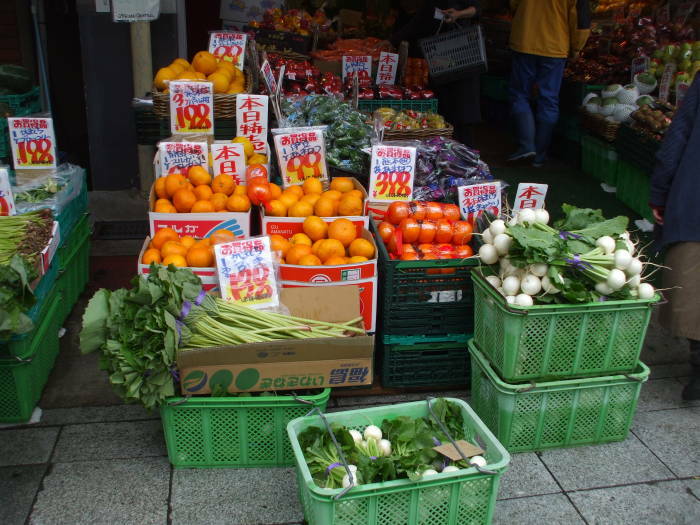 Before reaching the train station area we pass a large supermarket with an impressive array of produce. 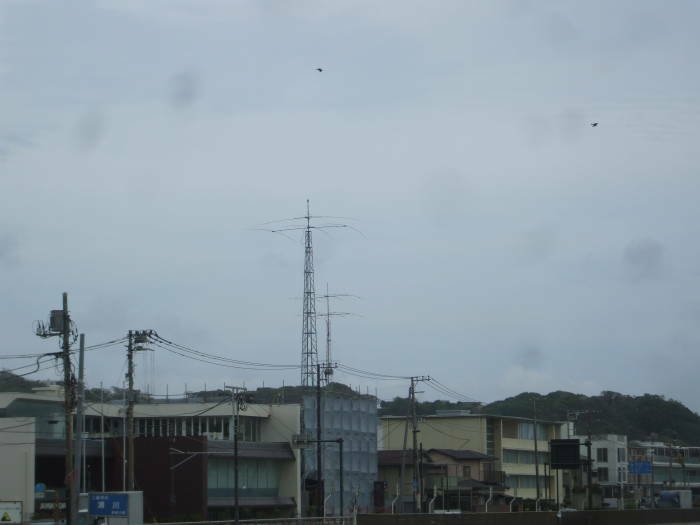 A building across Wakamiya Ōji from the central train station has an impressive array of antennas on its roof. A crank-up tower has several single-band rotatable antennas, 40m (7 MHz) through 10m (28 MHz), and both 6m (50 MHz) and 2m (144 MHz) on another tower. 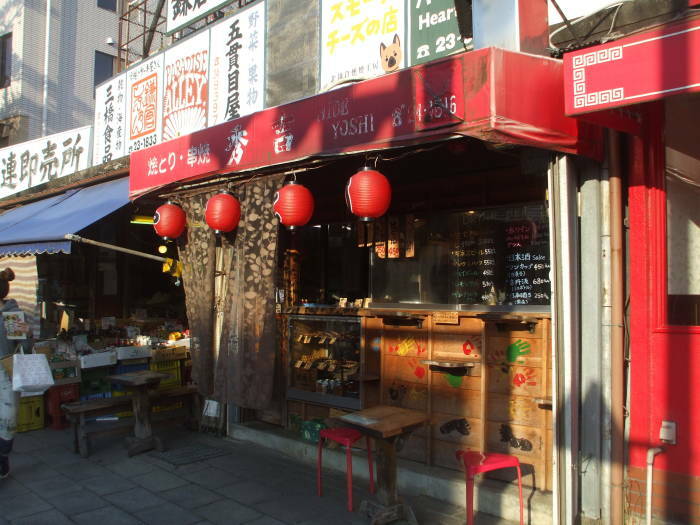 Just south of the train station is a cluster of a small grocery store and two places with yakitori and similar snacks and light meals. 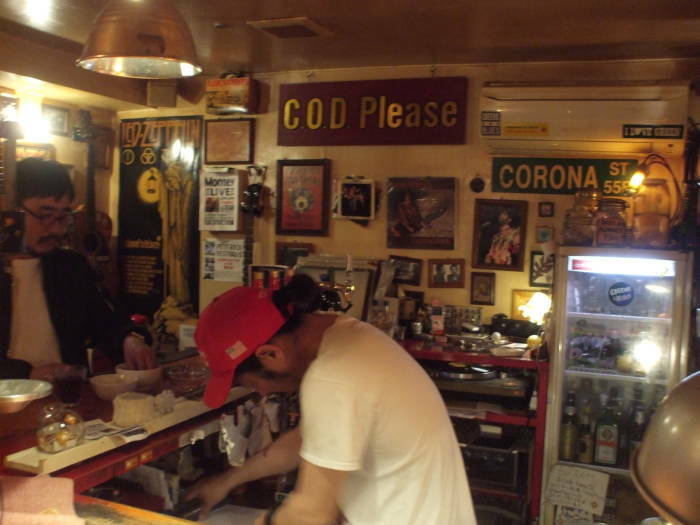 One thing I discovered is that there is almost nowhere to sit down in Japan. Very few park benches and the like. 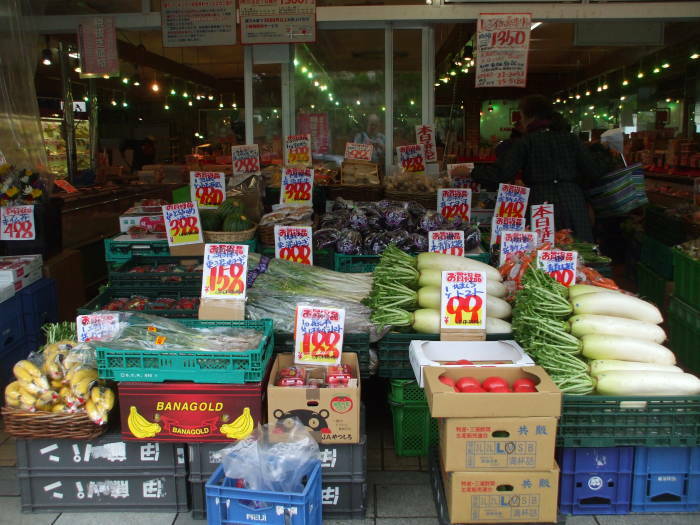 For the price of some light snacks, you can sit on their metal stool and watch Kamakura walk past. This didn't seem to be a tourist-oriented place at all, but they had English labels on things. It was no problem to simply point, which is what I did every time I visited. The person behind the counter didn't know any English words for things. My favorite at these places was usually some sort of chicken with green onions. Wakamiya Ōji is the main north-south axis of Kamakura, the ritual path from the waterfront to the main shrine. Komachi-dori or Komachi Ōji runs parallel to it, the next major street to the west. 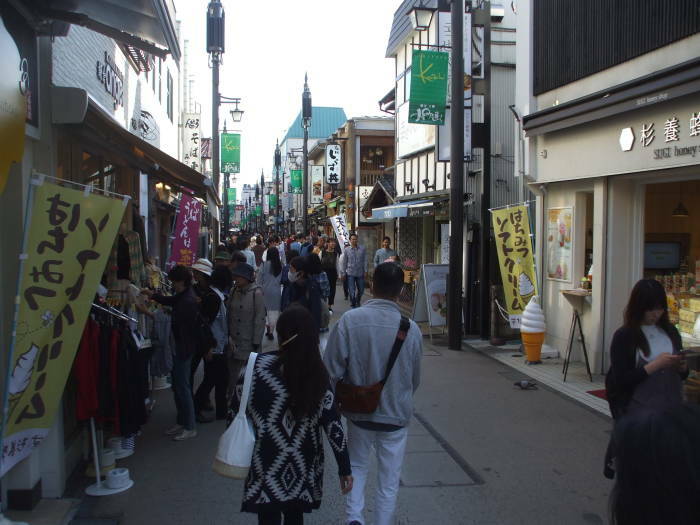 Komachi-Ōji is lined with shops and boutiques for visitors, most of whom are from other places in Japan. If you want soft-serve ice cream in varying intensities of matcha or green tea flavor, this is the place to come. "But", you say, "I want to spend some time in a cafe with owls." Then this is also the place to come! Japan has famously had cat cafes for some time. Now that has expanded to owl cafes. 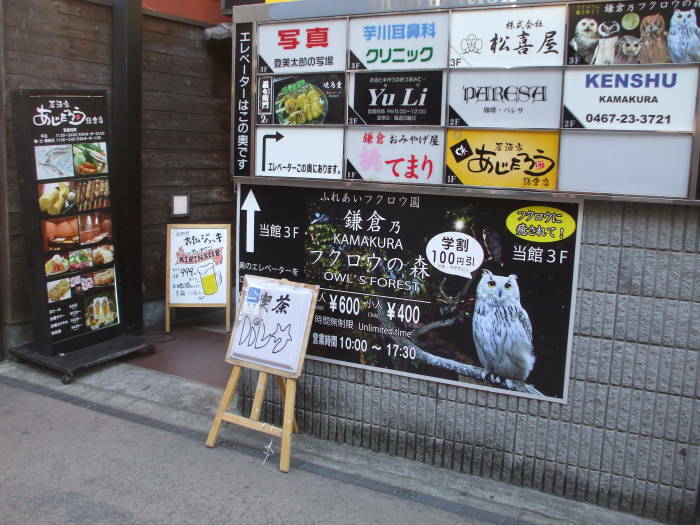 Some of the owl cafes, although apparently not this one, also have a falcon or hawk or two. 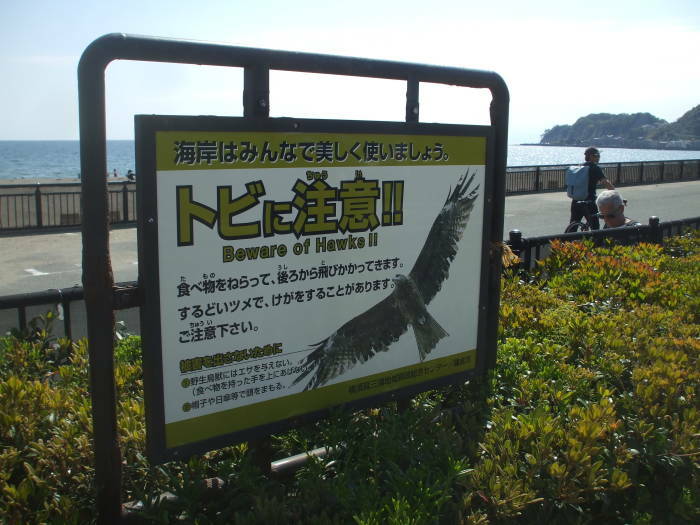 In Kamakura, hawks are available for free down at the beach. I wonder what would happen if you went to the owl (and falcon or hawk) cafe with a box of mice. Not that I'm recommending that. But it does occur to me as a possibly exciting evening at the owl cafe. 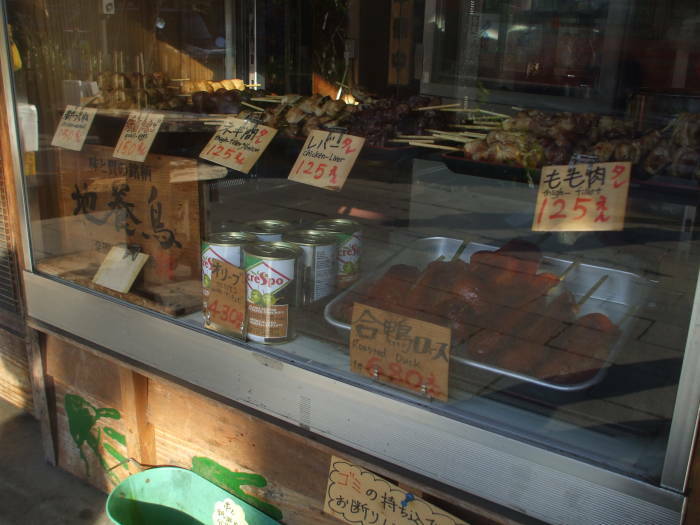 "But I want to eat all the raw ham I can eat within 60 minutes for the low price of just ¥500! ", you say. Then you can also meet that goal here! Trichinella spiralis has been almost entirely eliminated from domestic swine, and the main risk is from wild pigs and other game animals including bear. 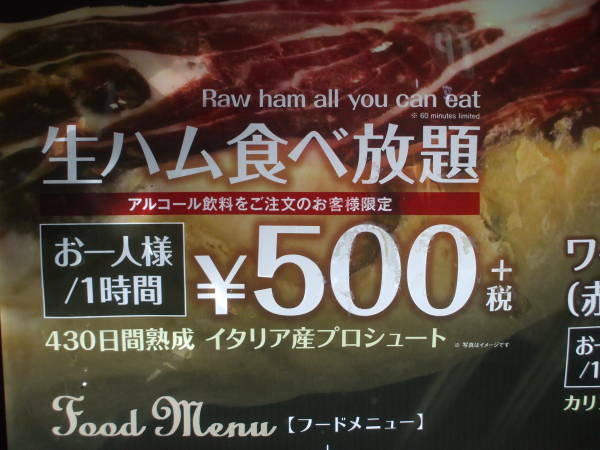 But still, 60 minutes of unlimited consumption of raw ham seems dicey. Old habits die hard. Notice "Food Menu" on this sign. The katakana next to it, フードメニュー, just phonetically spells out "fu-do me-ni-yu". It's nominal English transliteration done for style points only, as you commonly see in Japan. 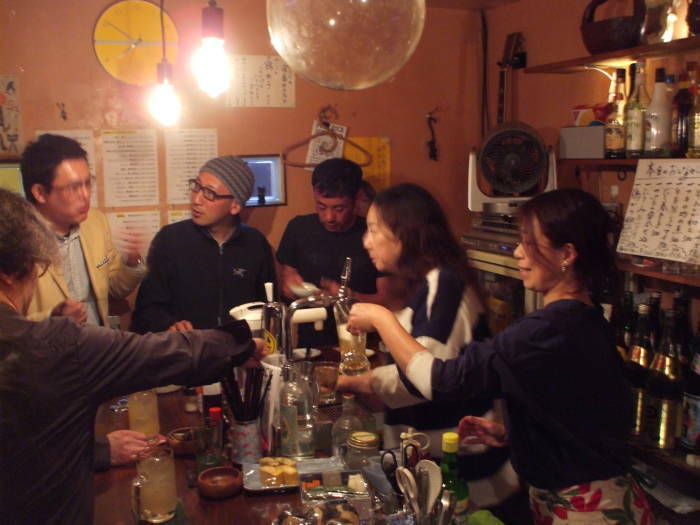 I went to two tachinomiya or stand-up bars. I was the only person from out of town at both. 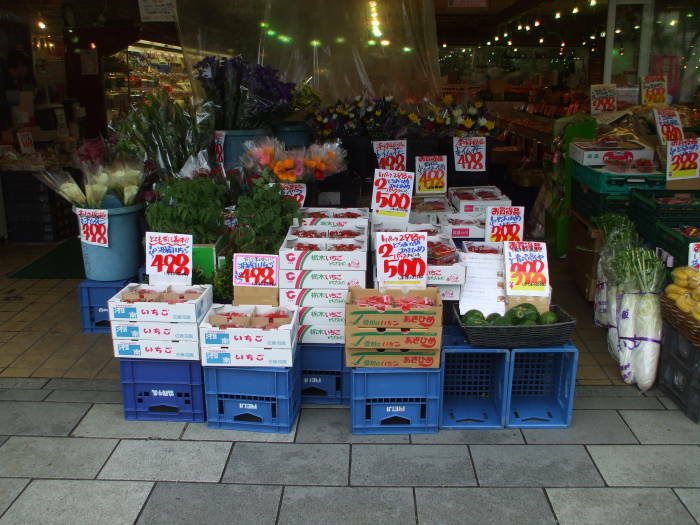 Click on either picture or the links for the page on tachinomiya.